rastegar, H., Rasti-Barzoki, D. (2017). Multi-criteria approach to project portfolio selection considering structural hardness and correlations between projects. 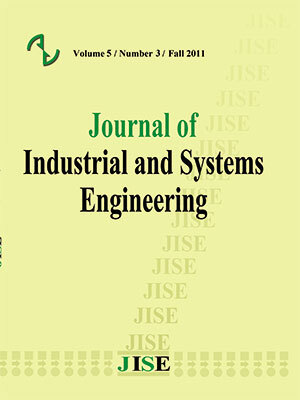 Journal of Industrial and Systems Engineering, 10(4), 141-157.
hamid rastegar; Dr. Morteza Rasti-Barzoki. "Multi-criteria approach to project portfolio selection considering structural hardness and correlations between projects". Journal of Industrial and Systems Engineering, 10, 4, 2017, 141-157.
rastegar, H., Rasti-Barzoki, D. Multi-criteria approach to project portfolio selection considering structural hardness and correlations between projects. Journal of Industrial and Systems Engineering, 2017; 10(4): 141-157. Project portfolio selection is very important subject of decision-makers in project-based organizations. The best assignment of resources to the most appropriate projects is necessary as financing projects with low benefit is just waste of organization's resources. However, existing project selection models pay not much attention the structure and special features of projects as a selection criterion, while their hardness may prolong the project duration and even result in stopping the project. Furthermore, the models cannot consider correlations between projects which may affect the results of projects. In this paper, a model is proposed to measure the structural hardness of projects. Then, a project portfolio selection model is proposed considering hardness and correlations between projects. A case study is presented to test the performance of the model in real world problems. At the end, some large-sized numerical example has been solved. The results show the capability of the model to solve large-sized problems in a suitable time. The important role of structural hardness in project selection was discussed and sensitivity analysis has been done. Anagnostopoulos, K. and Petalas, C. (2011). "A fuzzy multicriteria benefit–cost approach for irrigation projects evaluation." Agricultural Water Management 98(9): 1409-1416. Asher, D. (1962). "A linear programming model for the allocation of R and D efforts." Engineering Management, IRE Transactions on(4): 154-157. Badri Masood, A., Davis, D. and Davis, D. (2001). "A comprehensive 0–1 goal programming model for project selection." International Journal of Project Management 19(4): 243-252. Blanning, R. W. (1981). "Model-based and data-based planning systems." Omega 9(2): 163-168. Brewer, P. C. (1993). "Managing uncertainty." Strategic Finance 75(4): 39-45. Fox, G. E. and N. R. Baker (1985). "Project selection decision making linked to a dynamic environment." Management science 31(10): 1272-1285. Esfahani HN, hossein Sobhiyah M, Yousefi VR. Project Portfolio Selection via Harmony Search Algorithm and Modern Portfolio Theory. Procedia-Social and Behavioral Sciences. 2016;226:51-8. Fliedner T, Liesiö J. Adjustable robustness for multi-attribute project portfolio selection. European Journal of Operational Research. 2016;252(3):931-46. Ghapanchi, A.H., Tavana, M., Khakbaz, M.H. and Low, G. (2012). "A methodology for selecting portfolios of projects with interactions and under uncertainty." International Journal of Project Management 30(7): 791-803. Ghorbal-Blal, I. (2011). "The role of middle management in the execution of expansion strategies: The case of developers’ selection of hotel projects." International Journal of Hospitality Management 30(2): 272-282. Grossman, G. M. and C. Shapiro (1987). "Dynamic r & d competition." The Economic Journal: 372-387. Han, S., Diekmann, J., Lee, Y., and Ock, J. (2004). "Multicriteria Financial Portfolio Risk Management for International Projects." Journal of Construction Engineering and Management 130(3): 346-356. Hassanzadeh, F., Modarres, M., Nemati, H.R. andAmoako-Gyampah, K. (2014). "A robust R&D project portfolio optimization model for pharmaceutical contract research organizations." International Journal of Production Economics 158: 18-27. Iamratanakul, S.,Patanakul,P., Milosevic,D. (2008). "Project portfolio selection: From past to present." Proceedings of the 2008 IEEE ICMIT: 287-292. Khorramshahgol, R., Azani,H., Gousti,Y.(1988). "An integrated approach to project evaluation and selection." Engineering Management, IEEE Transactions on 35(4): 265-270. Liberatore, M. J. (1987). "An extension of the analytic hierarchy process for industrial R&D project selection and resource allocation." Engineering Management, IEEE Transactions on(1): 12-18. Liberatore, M. J. and Stylianou,A. C. (1993). "The Development Manager's Advisory System: A Knowledge‐Based DSS Tool for Project Assessment." Decision Sciences 24(5): 953-976. Liesiö, J. and A. Salo (2012). "Scenario-based portfolio selection of investment projects with incomplete probability and utility information." European Journal of Operational Research 217(1): 162-172. Liu, S.-S. and C.-J. Wang (2011). "Optimizing project selection and scheduling problems with time-dependent resource constraints." Automation in Construction 20(8): 1110-1119. Luehrman, T. A. (1998). "Investment opportunities as real options: getting started on the numbers." Harvard business review 76: 51-66. Martino, J. P. (1995). Research and development project selection, Wiley Series in Engineering & Technology Management. Mavrotas, G. and D. Diakoulaki (2005). "Multi-criteria branch and bound: A vector maximization algorithm for Mixed 0-1 Multiple Objective Linear Programming." Applied Mathematics and Computation 171(1): 53-71. Mavrotas, G. (2009). "Effective implementation of the ε-constraint method in multi-objective mathematical programming problems." Applied Mathematics and Computation 213(2): 455-465. Mavrotas, G., Diakoulaki, D. and Kourentzis, A. (2008). "Selection among ranked projects under segmentation, policy and logical constraints." European Journal of Operational Research 187(1): 177-192. Medaglia, A.L., Graves, S.B. and Ringuest, J.L. (2007). "A multiobjective evolutionary approach for linearly constrained project selection under uncertainty." European Journal of Operational Research 179(3): 869-894. Mousavi, S. M., Hajipour, V., Niaki, S.T.A. and Alikar,N. (2013). "Optimizing multi-item multi-period inventory control system with discounted cash flow and inflation: two calibrated meta-heuristic algorithms." Applied Mathematical Modelling 37(4): 2241-2256. Namazian A, Yakhchali SH. Modeling and Solving Project Portfolio and Contractor Selection Problem Based on Project Scheduling under Uncertainty. Procedia-Social and Behavioral Sciences. 2016;226:35-42. Okoli, C. and S. D. Pawlowski (2004). "The Delphi method as a research tool: an example, design considerations and applications." Information & management 42(1): 15-29. Paolini, A. (1977). "Project selection methods that pick winners." Research Management 20: 26-29. Rabbani, M.,Aramoon Bajestani, M. andBaharian Khoshkhou,G. (2010). "A multi-objective particle swarm optimization for project selection problem." Expert Systems with Applications 37(1): 315-321. Sackman, H. (1974). Delphi assessment: Expert opinion, forecasting, and group process, DTIC Document. Schaeffer S, Cruz-Reyes L. Static R&D project portfolio selection in public organizations. Decision Support Systems. 2016;84:53-63. Sefair JA, Méndez CY, Babat O, Medaglia AL, Zuluaga LF. Linear solution schemes for Mean-SemiVariance Project portfolio selection problems: An application in the oil and gas industry. Omega. 2017;68:39-48. Shakhsi-Niaei,M., Shiripour, M., Shakouri, H. and Iranmanesh, S.H. (2014). "Application of genetic and differential evolution algorithms on selecting portfolios of projects with consideration of interactions and budgetary segmentation." International Journal of Operational Research 22(1): 106-128. Shakhsi-Niaei, M., Torabi, S.A. and Iranmanesh, S.H. (2011). "A comprehensive framework for project selection problem under uncertainty and real-world constraints." Computers & Industrial Engineering 61(1): 226-237. Skulmoski, G.J., Hartman, F.T. and Krahn, J. (2007). "The Delphi method for graduate research." Journal of Information Technology Education: Research 6(1): 1-21. Souder, W. E. and T. Mandakovic (1986). "R&D project selection models." Research Management 29(4): 36-42. Tavana M, Keramatpour M, Santos-Arteaga FJ, Ghorbaniane E. A fuzzy hybrid project portfolio selection method using data envelopment analysis, TOPSIS and integer programming. Expert Systems with Applications. 2015;42(22):8432-44. Vira, C. and Y. Y. Haimes (1983). Multiobjective decision making: theory and methodology, North-Holland. Weber, R., Werners, B. and Zimmermann, H.J. (1990). "Planning models for research and development." European Journal of Operational Research 48(2): 175-188. Winkofsky, E.P., Baker, N.R. and Sweeney, D.J. (1981). "A decision process model of R&D resource allocation in hierarchical organizations." Management science 27(3): 268-283. Yu, L., Wang, S., Wen, F. and Lai, K.K. (2012). "Genetic algorithm-based multi-criteria project portfolio selection." Annals of Operations Research 197(1): 71-86.